St.Liborius was born of an illustrious family of Gaul (a region in the Roman Empire which extended to the area on the west bank of the Rhine river of the present day Germany), and became Bishop of Le Mans, France. 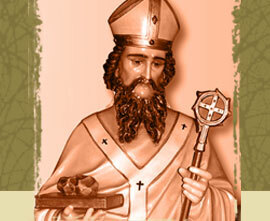 He was a trusty companion to St. Marinus (Martin of Tours). They were both bishops, neighbors in office. St. Liborius was bishop for about 49 years and ordained 217 priests, 186 deacons and 93 sub deacons and other churchmen. He is said to have died on July 23, 397 A.D. with Bishop Martin at his side. Much of the ministerial life of Bishop Liborius covered the second half of the 4th century. By this time, the Roman Empire ended its persecution of Christianity with Emperor Constantine the Great’s Edict of Milan in the year 313. Freed from persecution, the Christian faith was now free to grow. However, during this time, foreign tribes roamed the land. There was chaos and misery. Bishop Liborius’ Episcopal area had been Christian for some time but heathen Druids were still active and through their mysterious pagan rites were able to influence the people. So, Bishop Liborius built many churches and celebrated the Eucharist with piety and dignity. The well-trained priests in his diocese finally triumphed over the Druids. Nowadays, we would call the works of Bishop Liborius and his clergy at the time as primary evangelization. In the year, 836 A.D., (9th century), the relics of Saint Liborius were brought from Le Mans, France, to Paderborn, Germany. At this time, relics of the saints were well guarded and venerated in churches and dioceses which had them. The willingness of the diocese of Le Mans to handover the relics of St. Liborius to the diocese of Paderborn was a true act of charity. The event forged a long lasting friendship between the sister cities of Le Mans and Paderborn; it has existed for over 1,000 years to this day. Fr. Rempe, the first Parish priest of St. Liborius, Steger, Illinois, was born in Zalzkotten in Germany near the cathedral town of Paderborn. His family immigrated to the United States in 1883. He had requested for the relic of St. Liborius from the Bishop of Paderborn for his new Parish and he received it. This was the beginning of the Parish called St. Liborius in Steger, IL, which was established in 1902 with 40 Catholic families in and near the area. St. Liborius is also the Patron Saint of the Paderborn Cathedral Parish in Germany. The city celebrates his feast on July 23 followed by a week of “Liborifest” with procession through the city, Masses and other festivities. Saint Liborius is depicted as a bishop with a peacock. (Legend has it that a peacock led the procession of his remains from Le Mans to Paderborn.) His image may be carrying small stones on a book. He is invoked against colic, fever and gallstones illnesses. St. Liborius, pray for us. Sauk Trail, for many generations, had been used by the Indian tribes of the Great Lakes Region as a route to warmer climates to the south and west during the hunting season. It cut through the area now called Park Forest. Settlers moved into the area carrying the faith of their fathers and their fathers’ fathers from generations past. It was their dream to continue their traditions and to secure them for their own families. So these pioneer families came together, pooled their strengths and resources and established a place of worship to attest to their Catholic vision. By 1859, St. Anne’s Church, which stood in what is now Richton Park, along with the two Mission churches of St. James in Strassburg and St. Boniface in Monee, served the areas along Sauk Trail as the center of Catholic life. Roads were little more than the cleared Indian trails, with the addition of wagon ruts, which in rainy weather made them almost impassable. Sunday Mass alternated between the three churches. The priest would say mass at different times and on different days, traveling on horseback or by buggy or wagon on the worst of roadbeds. Frequently, individual families had to make sure that the pastor reached his destination, lending their time and means of transportation to meet the pastor’s schedule. Without them, the priest could not have met the spiritual needs of the parish. Worshippers might have to walk long distances to participate at Mass, often in the company of another neighboring family. Even after the invention of cars, this roundtrip might be 2 or 3 hours on a spring day. It was truly a gift of love…love of God and each other. There were other gifts as well. Parish families made sure the priest had food, tithing dairy products and produce from their farms, even in lean years. In 1901, the Steger piano factory in Columbia Heights (now Steger) had been attracting growing numbers of Catholic families to the area. On July 1, St. Anne’s was struck by lightning, burning both Church and rectory to the ground. Archbishop Feehan of Chicago directed that St. Anne’s Church be rebuilt as a mission station to a new parish he ordered established in Steger, transferring all parish goods and records there. Rev. Joseph Rempe was named pastor for about 40 Catholic families in and near the area. Fr. Rempe was born in Salzkotten in Germany near the cathedral town of Paderborn. Immigrating to the United States in 1883, he was consecrated a priest in the Chicago archdiocese in 1887. Fr. Rempe’s first task was to purchase five one-acre lots on the corner of Green St. and Steger Rd. It was Fr. Rempe who told the families of St. Liborius and it was through his friend, Auxiliary Bishop Augustinus Gockel of Paderborn that a first class relic of the saint was sent to them. That was the beginning of the parish called St. Liborius. On the five acres, a small, white wooden structure with a stone foundation was built for $3,727.00 and served as both Church and rectory. A simple bell tower with a cross at its peak sat atop the church roof. The sanctuary was lighted with candles. The few adornments gilded in gold leaf glittered. Wooden statues of the Sacred Heart, the Blessed Mother and St. Liborius stood watch over the interior. The altar rail was draped with a hand-embroidered cloth. The wooden kneelers on the wooden floors allowed no movement to be unnoticed. The newly erected Church was dedicated on March 2, 1902. Liborius, the saint of peace, unity and healing, became the patron of this new parish as well. In 1903 Fr. Rempe was succeeded by Fr. Leonard Schlimm, a Benedictine, who purchased a half block of city land at Halsted and 35th St., moving the combination building there from its old location. In 1904, Fr. Anthony Berger replaced Fr. Schlimm and remained pastor until June of 1907. The old parish safe, bearing the date of purchase and the name of Fr. Frank Schildgen, testified to his pastorship, which lasted for the following three years. In April of 1910, a young Fr. Theodore Gross assumed the post of pastor. His predecessors realized the need for a parish school, but saw building a new Church to vacate the old building for classrooms and quarters for the teaching sisters as the way to achieve their aim. Fr. Gross made the school his prime goal in order to insure the spiritual training of the parish children. He ordered work to begin on the parish school almost at once. On Sunday, September 22, 1912, with much ceremony, bands playing and banners waving, Archbishop Quigley was greeted at the C&EI station and brought to bless the parish school. The School Sisters of St. Francis who came from Milwaukee, took on the job of teaching the 160 students enrolled in the new school. The second floor of the school was reserved for convent quarters, including cooking facilities. The school’s first floor was divided into 4 classrooms with two grades in each room. One sister presided over each classroom. This ended the need for the weekly visits of the priest to each mission church for catechism. The sisters taught not only the Three-Rs, but the fine arts as well. The students either brought their lunch or walked home for the midday meal. Many of the farm children, in order to be able to attend school, had to live with friends or relatives closer to school during the week. Even then, tuition was a hardship for many families…50 cents a month was more than they had to spare. Discipline was lovingly given for the good of the child. We have all heard the tales of the march to the cloakroom with ‘Sister.’ Heaven forbid that ‘Sister’ would have to notify a parent of a student’s behavior. Not a hair would move if ‘Father’ came in to talk about student actions! St. Liborius Parish now fully administered the three mission churches, a very large task. Fr. Gross appealed to the Archbishop for an assistant. Fr. Aloysius Schmitz, a husky, young priest was sent to fill the request. Fr. Schmitz was a breath of fresh air, as he was personally involved with the school children’s activities, even participating with the school baseball and football teams. In 1917, Fr. Gross was transferred and Fr. John Ott was assigned to fill his position. Fr. Schmitz remained as the parish assistant. Fr. Ott worked to pay off the debt for the school building by staging frequent dinners and bazaars. In the spring of 1921, Fr. Conrad Plomin replaced the transferred Fr. Schmitz as the new assistant. In 1925, Fr. Ott was transferred and Fr. Plomin became pastor, guiding parish affairs for 11 years until his death in June 1936. Shortly after, Cardinal Mundelein of Chicago appointed Fr. Martin Weidner pastor. This was a time of many converts to the Church and many improvements to the parish, including a 20-foot addition to the Church building and a complete renovation of the inside and outside of the old church/rectory building. Fr. Weidner died of a heart attack in 1940, and was buried in the parish cemetery. Between Cardinal Mundelein’s death and the appointment of Cardinal Stritch by Pope Pius XII, Bishop Bernard Sheil became temporary administrator of the Archbishop of Chicago. He named Fr. John J. Rengel as the new pastor of St. Liborius. These were war years and everyone was employed. It was Fr. Rengel’s aim to take advantage of this timing and begin to collect funds for a new Church. In reality, his main accomplishment was the renovation of the four classrooms and replacement of the school heating systems and wiring. In August of 1947, Cardinal Stritch transferred Fr. Rengel and called Fr. Raymond H. DeMuth back from vacation to assume the post. In spring of 1948, Auxiliary Bishop William O’Brien of Chicago confirmed a large class of children and adults at St. Liborius and indicated need for a new Church. Once again, the more immediate need for school space as enrollment increased, shelved the project. By now, the Joliet Diocese was being created. The recently appointed Bishop, Martin McNamara, gave Fr. DeMuth authority to build a new, separate convent, intended to free the top floor of the school for four extra classrooms so that each grade would have its own room and teacher. The first lay teacher came to the parish to fill the need for teachers. On October 19, 1952, Bishop McNamara blessed the large, new Convent. Fr. Salvatore Giunta was acting assistant, and the parish was by then serving more than 350 families. In 1954, the last note of debt on the convent was burned, and a new Church Fund was finally begun. By 1957, with over 1,000 families in the parish, preparations were made to build the new Church and Rectory. Fr. DeMuth and an architect proposed plans. Bishop McNamara again gave permission, and in late 1957 contracts were signed and excavation was begun. On Mother’s Day, 1959, Frs. DeMuth and Giunta and the parishioners of St. Liborius dedicated the new Church. It must be noted that in just about 50 years, the dedicated faith community of St. Liborius Parish had provided 2 churches, a school, a rectory and convent…a miracle of sacrifice to the Glory of God. In 1974, Fr. DeMuth became pastor emeritus and Fr. John Doyle was welcomed as pastor. At the request of Bishop Imesch, in 1988, Fr. Doyle was transferred to St. Ann’s in Crest Hill and Fr. Joseph Burns was named the new pastor of St. Liborius. This was the time that St. Liborius opened its doors and its hearts to the wonderful people from St. Rocco, St. Ann and St. Joseph parishes in Chicago Heights, who were looking for a place to call home after their parishes were closed. That action has brought many blessings to all involved. At this time, the parish was experiencing growing pains. In 1990, the convent was no longer used as living quarters for the sisters, but housed the Secretarial Offices, Pre-school, Kindergarten, and Library. After school hours, students who did not attend the parish school received religious education there, in preparation for reception of the sacraments; ministries of the parish also used its facilities as meeting places. The school lacked space for needed improvements and the parish lacked space for active ministries. It was at this time that Fr. Jim Kempfer from St. Paul’s in Peotone suggested a close look at a closed public school in the Crete-Monee School District. So, one day Father Joseph Burns and Business Manager Joanne Portegys decided to take a look into this possibility. The school located in Steger Estates, sat on 10 beautiful acres surrounded by farmland and it had a gym! Monies were extremely scarce, but possibilities were endless. Not only was there a much needed gym, there was also an area separated from the main school that could be used as an Early Learning Center to accommodate the children of working families. The parish did not have the money and economy was experiencing a down turn, but Bishop Imesch agreed to loan us the needed funds. The property was purchased and completely renovated with the help of thousands of volunteer hours from the excited and dedicated parishioners. By October of 1991 the satellite school was dedicated and was in operation. Pre-School, Kindergarten, and grades 1 through 4 occupied the main part of the building, with the Early Learning Center behind the gym. The old Convent was renamed the DeMuth Center and was used for the CCD children, and for many parish ministries. The vacated rooms in the old school building made way for the Computer and Science labs and the Library. In time to celebrate its centennial and 45 years after the completion of the new Church building, the people of St. Liborius Parish pledged to transform the interior of their Church into a haven of tranquility and beauty in which they could lift their hearts and worship their God. The Church was completely painted; new pews and carpeting were installed; new chandeliers were designed and hung; additions from the old communion rail were added to the sanctuary and altar; and changes were made in the choir loft, bathrooms and entryway, removing the old ‘crying’ room. Fr. Reynaldo Treyes became pastor in 2005. He saw the many vibrant ministries and organizations that St. Liborius had to offer, and organized them into a Commission/Ministry structure. He also established our Parish Pastoral Council according to diocesan guidelines. Visioning became the primary work of the council. Visioning is to focus on the future: how can St. Liborius function, grow and develop so that it is a continued empowerment of lived faith, living out our mission to make and nurture disciples? The council’s work is not on implementation, but rather on establishing focus and direction. In early 2010, it was announced that St. Liborius School would be consolidating with St. Mary School in Park Forest. The consolidated school would be at the Crete campus which was the newest of the existing facilities, and offered the most room for expansion. After many months of meetings with both parish pastoral councils and school boards, Mother Teresa Catholic Academy was born. Additional classroom space and a library/computer lab were added on to the building before it’s re-opening in the fall of 2011. The opening of Mother Teresa Catholic Academy left the St. Liborius School building in Steger open for many other uses. In addition to religious education classes for children, the classrooms are also used for weekly Bible Study, religious education for adults including R.C.I.A., and room for the Office of Faith Formation. The building was renamed the Religious Education Center. The Parish Hall on the lower level continues to be used for weekly Outreach meals for the needy, a food pantry, meetings, programs and events for many of the parish ministries. The DeMuth Center continues to be used by some ministries for meeting and prayer space. Fr. Dennis Spies became pastor in 2011. He quickly embraced the challenge of the new multi-parish school in addition to his responsibilities at the parish. With what has been described as “infectious enthusiasm,” he brings a new energy and vitality to St. Liborius and Mother Teresa Catholic Academy. St. Liborius has been blessed not only with the generosity of its people, but also for the special gifts of its foresighted clergy and its dedicated sisters. Physical help from one priest, unloading a coal car so that the church and others might have heat…spiritual help from another on his nightly walk, stopping to listen to concerns and problems…guidance to the childless that they might find the way to adopt…and to the unwed mother that she might find the strength to secure life…God’s blessings come in many ways. Although not widely known, intruders had entered our Church several times between 1988 and 1989. On one of those occasions, the relic of St. Liborius was taken from the altar stone. Attempts were made to foil and apprehend the culprits by securing the building except for times when services were held. Their activities were halted, but their identities remain a mystery. In time for the St. Liborius Parish Centennial celebration, Bishop Imesch was petitioned for a relic to replace that of St. Liborius in our altar. He graciously complied with the gift of a relic of St. Helena. The altar was re-consecrated in July 2002 in her name. Through her intercession and that of St. Liborius, our parish is being doubly blessed. The principles upon which our parish was founded have not changed, nor have the hearts of those it serves. The parish is family to each other. The people are active in the pursuit of ways to soothe the troubles of those around themselves. There remains a spirit of adoration, of love, of sacrifice and of service. God has truly blessed us at St. Liborius. Today, St. Liborius is a part of the Joliet Diocese, covers 95 square miles, and serves nine different communities. There are a total of 265 children enrolled at Mother Teresa Catholic Academy. There have been over 8000 baptisms, over 1500 weddings, and over 3500 funerals during the 110 years of the parish.